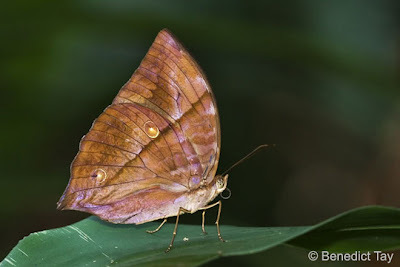 This month, we feature a butterfly that almost exclusively lurks around the dark shady forest understorey of Singapore's nature reserves - the Saturn (Zeuxidia amethystus amethystus). 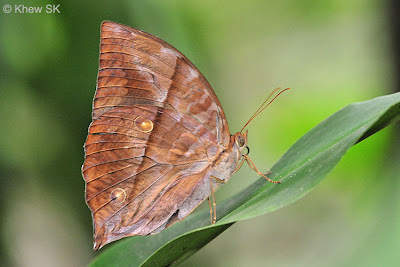 This species belongs to the family Nymphalidae ; Subfamily Morphinae, which comprise relatively large butterflies that prefer heavily shaded forested areas and generally fly no more than a few feet above the ground. 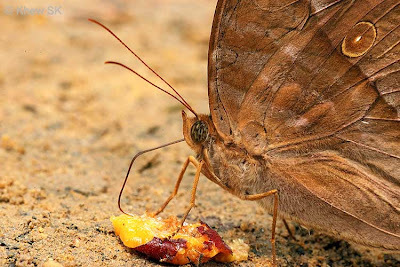 The majority of the species have drab and cryptic undersides that help the butterflies camouflage themselves amongst the forest leaf litter as they forage for food. The Saturn is a medium sized butterfly, usually attaining a wingspan of 100 mm or more. 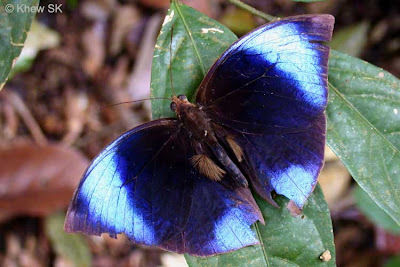 The males are black above, with a broad iridescent blue discal band on the forewing with a large tornal patch of the same colour on the hindwing. In the female, the blue is replaced with a pale yellow fascia and dull orange on the apical area of the hindwings. 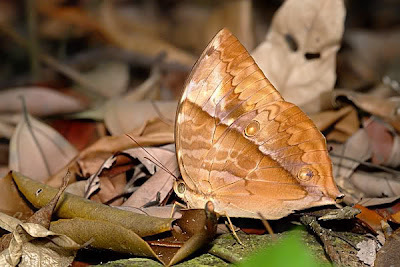 The undersides presents a leaf-like appearance with cryptic markings on a brown background and there are large ocelli on the hindwings. The Saturn is not rare, but remains mainly in the forested areas of the nature reserves. It is often encountered along forest paths, usually feeding on fallen fruits on the forest floor. Its cryptic undersides camouflage it very well amongst dead leaves and twigs. Very often, as one walks along the paths, the butterfly springs up from the ground as it is disturbed and very quickly flies away and settles amongst leaf litter to hide itself once again. 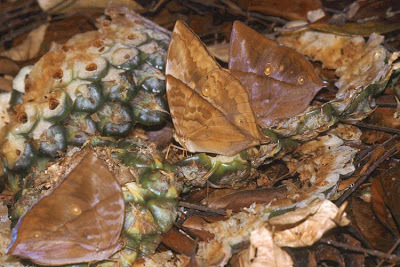 The species is partial to rotting fruit, e.g. papaya, guava or pineapple. 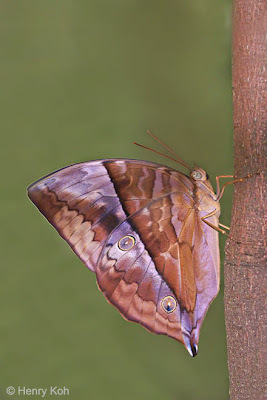 In Singapore, the Saturn is often observed feeding on rotting figs that have dropped on the forest floor, and is often found feeding in the company of other Nymphalidae butterflies like the Archduke, Dark Blue Jungle Glory and the Common Faun. Butterflies from the same Subfamily as the Saturn are known to frequent areas where palms and rattans grow. The various species are known to feed on different types of palms and rattans. Caterpillars of the Saturn have been bred on a species of Palmae by Igarashi, who observed that the caterpillars preferred to feed only on young tender leaves of the host plant. The caterpillar is green with short dark hairs. The head is horned and it has a pale yellow collar band, with a forked process at the posterior end of the caterpillar. The pupa is green with a pair of long 'horns' at its head and hangs from its cremaster head down along a leaf of the host plant. The adult butterfly tends to be usually active in the early morning hours and towards the later part of the day. 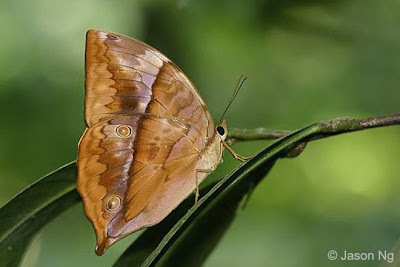 If undisturbed, they can stay perched on a leaf or a branch for long periods of time with its wings folded upright. The best time to approach the Saturn is when it is feeding on fermenting or rotting fruit, where it tends to be less skittish. At other times, the butterfly is very alert and is easily spooked by even the slightest movement, and is a difficult subject to photograph as it flies in the thick forested undergrowth. Text by Khew SK : Photos by Benedict Tay, Bob Cheong, Federick Ho, Henry Koh, Jason Ng, Khew SK & Simon Sng.